How To REALLY Clean Your Makeup Brushes – This is a post that I’ve been meaning to write up for a while, for those of you who know me will know that I’m a little bit of a clean-freak! I like to keep everything tidy, organised and of course – clean! It baffles me when I hear people say that they don’t wash their makeup brushes for weeks, for me it’s just as important as your cleansing your face and ideally we should be cleaning our make-up brushes daily too! If we can’t manage to clean our brushes daily then PLEASE try and aim to clean your make-up brushes at least twice a week – it really is an important part of your ‘beauty regime’ and shouldn’t be overlooked. Sadly a lot of skin problems and breakouts tend to start when we don’t look after our make-up brushes correctly and by simply washing them more often can reduce breakouts and problems! Think about it – when you don’t wash your makeup brushes, what happens? All of the oil from your skin and make-up starts to collect onto the bristles of your make-up brushes and over time becomes bacteria. This is then transferred onto your face and makeup products. Bacteria clogs your pores and starts to cause breakouts meaning you’ll need more make-up to conceal however what you’re actually doing is applying more bacteria to your skin. OK, so below I’ve also filmed a little video for you on how to REALLY clean your makeup brushes and one of the things you might notice is that I ‘pre-cleanse’ my make-up brushes before actually washing them hahaha! The reason I pre-clean my make-up brushes is because all the oil, makeup and dirt starts to breakdown meaning that when you actually clean your brushes its a lot quicker than normal. I normally use fairy washing liquid or a deep-cleansing shampoo for the pre-clean and then use a bit more when washing them in the sink, followed by a soak in warm water & conditioner and then another rinse to ensure everything has been removed!! 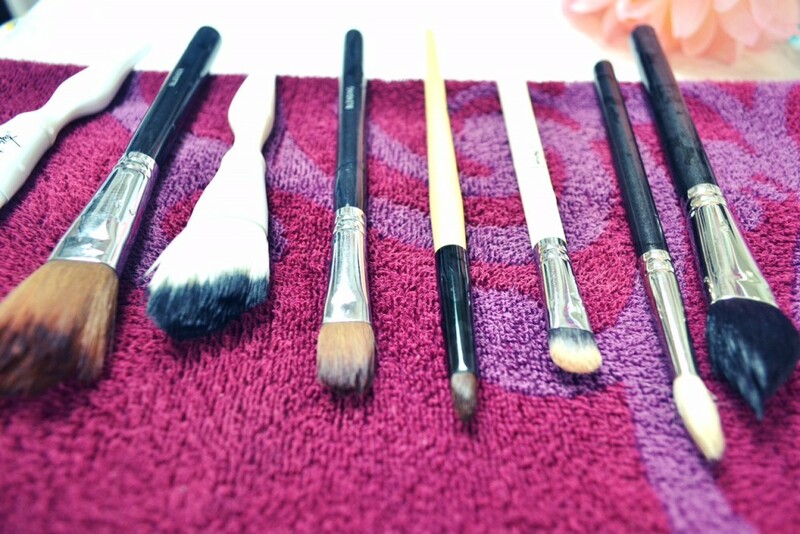 Let me know what you all think – how many times a week do YOU clean your makeup brushes? This is so great! I definitely need to do this more. Great job on the video! Thanks for sharing:-). Cleaning brushes can be such a pain but must be done. I rotate cleansers but am a fan of the BB solid, Sephora solid (which comes with a nifty silicone pad), Dr. Bronners, Baby Shampoo and the MAC brush cleanser. The thing that made all the difference was my Benjabelle Brush Tree though – makes the drying process so much easier! Thank you for sharing this! I actually learned the hard way how important it is to clean your makeup brushes regularly. I skin break out so bad and I was going to attend an event. I don’t use make-up brushes a lot but it’s good to know how to wash them properly! Thanks for sharing! Omg I need to know a tip how to clean my dirty brushes in a different way than I normal do. I usually buy a cleaning soap form Sephora! Thanks for the post:). It helps! I hope your week has been wonderful for you:). Love, kiss! I don’t usually wear makeup so I don’t have brushes or anything like that. I would’ve assumed that people would clean their brushes often though. Gorgeous brushes! I really don’t clean my brushes enough. Should do it more often, but atleast now I have a good cleaning routine with your tips! It’s so true that many people rarely clean make up brushes and that some breakouts are as a result of this,so I think it’s great and helpful that you finally put up this post because it will enlighten a couple of people. this is a very interesting article. I really needed to know how to clesn my brushes. Thanks for sharing this! These are great tips! This is so helpful! I have to admit I do need to clean my brushes more, and this has given me loads of tips in doing so! I am even embarassed while commenting to this beautiful post Layla! This post was actually meant for me really.. I should be actually ashamed of myself you know. Its not that i don`t know all this, Its also not that i`m not a cleaned and organized person but when it comes to my make up brushes, i get so relaxed. This isn`t a good behaviour. Thank you so much. I will start with cleaning my makeup brushes twice a week and see how things will go on for me.. I sometimes use baby shampoo to clean my bruhses because it’s not as harsh. This was such a cool video. I loved it. Clean brushes are so, so important! Love this how-to, lady! Great video, Layla. Thx for sharing the tips. I really clean my brushes twice a month and I think it’s ok, don’t you?